Factory automation, safety automation & process automation products. 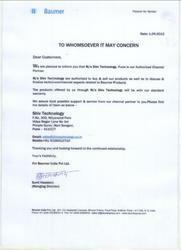 "Shiv Technology" established in 2012 is an authorized distributor, importer & supplier in India for Baumer Hubner, Baumer Electric, Baumer Thaleim, Baumer IVO, Becker Vacuum Pumps, Testo. M/S Shiv Technology is closely located at Pune. Our core competency is providing technological solutions for your challenging application where in you would like detect, measure, monitor and process the target. We provide you with an efficient solution - matched to your individual application and industry requirements. We are exporting in all over the world. M/S Shiv Technology is closely located to Baumer India Head Quarter in Pune. 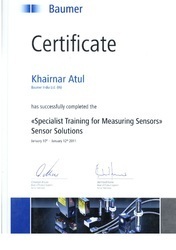 Being ‘X’ employee for Baumer Group, our core competency is providing technological solutions for your challenging application where in you would like detect, measure, monitor and process the target. We provide you with an efficient solution - matched to your individual application and industry requirements. We have attained huge prominence in market with the market under the guidance of Mr. Atul Khairnar. We take pride in our deep knowledge of Automation Technology, its various applications, technical requirements and ambient conditions of several markets. Drawing on our tried and tested experience, we can be sure to give you an immediate suggestion using proven technology - an intelligent solution that will contribute to reducing your total costs. Our consistent efforts to offer quality collection of Factory Automation & Process Automation Products, Motion Control Technology etc. have given us the popularity of being a prominent company. The entire range is extensively recognized by our valuable clients owing to their features like compact design, durability and longer service life. Our Certificate for best work performance. Baumer India & Shiv Technology has strategic vision is to gain maximum market share of industrial automation in India. By working hand to hand our partnership aim to explore, create & deliver values to our customers. What makes us different is our approach to customers. We follow the philosophy of our principal in order to equal binding & constant quality Service to customers. We at SHIV Technology are convinced that real success can only be achieved through great partnership & working together in supporting each other and keeping a relentless focus on delivering high quality service to our customers. With Immense pleasure, we are introducing ourselves as one of the leading exporters and suppliers of wide range of Factory Automation Products, Industrial Products, Motion Control Technology, etc. We have continuously gained applauds by our clients for our quality oriented approach and on time delivery.